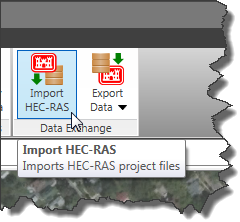 Often users will export a HEC‑RAS model from GeoHECRAS for project submission. 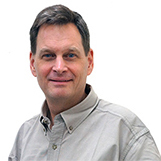 During the process, changes might be made to the exported HEC‑RAS model using the Army Corps of Engineers HEC‑RAS software. To update the existing GeoHECRAS model with these HEC‑RAS model changes, re-import the HEC‑RAS model into GeoHECRAS so that the project database is re-synchronized. The software will not automatically recognize that there were external changes made to the HEC‑RAS model. 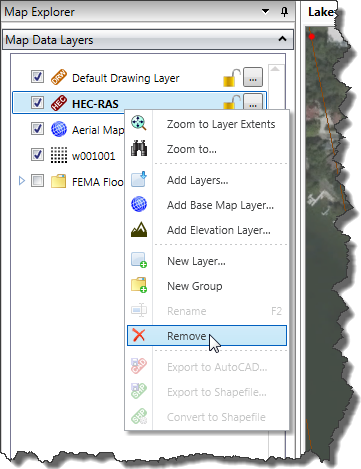 The easiest way to do this re-synchronization is to right click on the HEC‑RAS layer within Map Data Layers panel and choose Remove from the displayed context menu. This will remove the HEC‑RAS model data from the GeoHECRAS project and make room for the revised HEC‑RAS model to be re-synchronized. Then, import the revised HEC‑RAS model into the GeoHECRAS project. The HEC‑RAS model will re-synchronize with the GeoHECRAS project at the same model location, along with the changes that were made.